Vision of the Church in the Community. Food warehouse, one of our highest priorities—Bread of Life is a “Joseph church” for the community. Our small food distribution center is continually receiving and giving out food. This would include an additional utility van(s). We are engaged in "Food Evangelism" to the community. Many people have come to know the Lord through this. Housing for those coming off the streets, and low income housing. Send out more ministers to reach the world. The love, acceptance, and forgiveness of Jesus Christ to the sinner. Healing and restoration to hurting hearts, broken lives and sick bodies. Deliverance to the captives, whether it be from the powers of evil, habits and addictions, or limited lives. Release to divine destiny for all believers. Practical help to people in need and those seeking a better and higher life. Bread of Life Foursquare Gospel Church started before it started. One of the founding Pastors, Ellen Wohl, was deep in intercessory prayer when a woman came to comfort her. That woman became a founding donor of the church. Soon thereafter, God led the Pastor Ellen Wohl and Pastor Nancy Eskijian to start a church. He told them to do so on a Wednesday. They rented a small storefront that day and by Sunday the church had its first service. The rest is history, or history in the making. Bread of Life is a history making church, it is a symbol of what God wants to do, and it is dedicated to the Lord. First, Bread of Life is a fusion of Jew and Gentile. Pastor Ellen Wohl is of Jewish ethnicity, and was raised as a Jew in Cleveland, Ohio, under the teaching of Rabbi Hillel Silver. God spoke to her in a church she was visiting in Santa Monica, California, and said “stay here.” The next Sunday she gave her life to the Lord. Soon thereafter she founded Church in the Park, a church to the homeless in Santa Monica, being joined by Pastor Nancy Eskijian a few years later. Pastor Nancy Eskijian, the other founding pastor, is of Armenian ethnicity. Her grandfather was a pastor in the city of Aleppo, Syria, during the Armenian Genocide, where he lost his life saving thousands from death. The congregation of Bread of Life is African American and Latino. English and Spanish are spoken and sung at every service. Many of our members are “up from the street” and are now serving God. They have been changed from an old life to live the abundant life in Christ. The message of our church is many things, but the central one is transformation through the power of the cross and the resurrection. We intend to turn over the soil of religious notions. We intend to turn over hearts for good soil so that the Lord can be reproduced. We intend to confound the wise, because for a small “in the natural” church, it is big in the spirit with a big God. Besides its core ministries of worship and teaching the Word of God, the church regularly gives away food, clothes, hygiene and cleaning supplies, and other items at each service, and helps people in crisis with rent, utility bills, medicine, housing accommodations and transportation. We believe in meeting the needs of people who come to our door, many times with emergency funds and food. Bread of Life also has two Spanish speaking pastors. Bread of Life reaches over 4000/month by its food pantry at the church and by its food pantry at the Imperial Courts Housing Project in the Watts area of Los Angeles. We feed close to 350 persons a month, through free lunches and around 400 persons per month in our downtown outreach. These outreaches not only help people in need but create givers and disciples. In the last five years, Bread of Life has served a population of over 110,000 people. Small churches such as ours are the capillaries of ministry to the inner city, bringing supplies of love, truth and hope. We must continually demonstrate our help in tangible ways, as well as preach the truth and love of Jesus Christ. Many people have been saved, healed, filled with the Holy Spirit, set free and delivered at Bread of Life. However, our life in Christ isn’t someplace we arrive, but an ongoing transformational work. We are preparing God’s people for Him, to be like Him, and to live through Him. 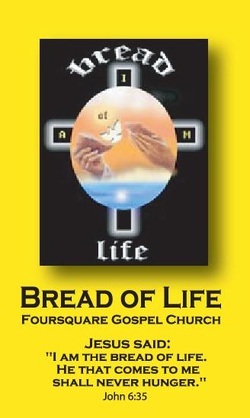 Bread of Life Foursquare Gospel Church is located in Los Angeles, California, at 5179 W. Washington Blvd., LA 90016. It has been in existence since 1995. We rent four contiguous storefronts, and would like to obtain a warehouse where we can serve the Lord and the community.